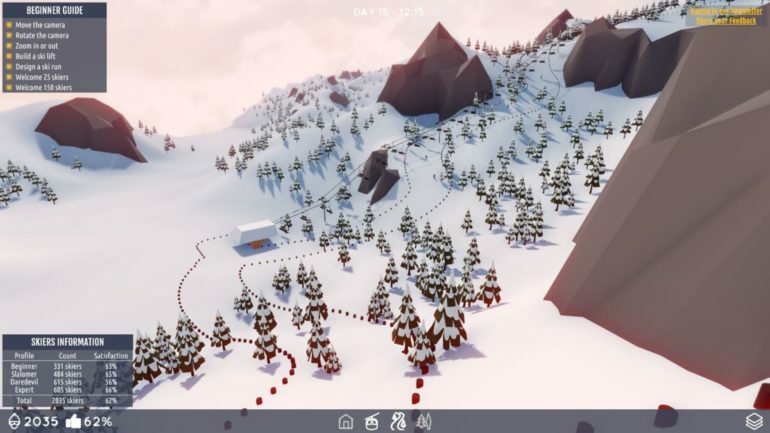 While a pair of developers at Tea For Two were on a skiing holiday, inspiration struck when they began to wonder why there were no good tycoon games based around ski resorts. So the team threw together an alpha demo on popular indie platform Itch.io and here we are. Snowtopia is exactly what it sounds like. You’re in charge of building a ski resort. I got my hands on the open alpha and as you can imagine, it is fairly bare bones right now, but the game is already showing a lot of promise. At the moment there’s no business aspect to it, as the team have focussed on getting the building aspects down. Firstly, you can build ski lifts. They’re fairly straightforward: if you’ve played any tycoon games from the past 10 years, then it’s simply a case of clicking where you want it to start and end. These transport your skiers up hills or across them, to get them to the various ski courses that you have created. Building the ski courses is where this game really comes into its own. Just like Rollercoaster Tycoon and its ilk, you can’t just make crazy courses — if they’re too extreme people won’t use them. When ‘drawing’ them on the snowy hillside, the path you draw displays colours, from green, to yellow, to red, to black. Green courses are nice and easy, red are challenging and by the looks of it, black is suicidal. It’s a neat little piece of gameplay, and I assume in the main game that you’ll have different levels of experience in the skiers that visit your resort based on what courses you have, and it’ll mean you’ll have to build different ones if you want to appeal to everyone. The open alpha is available on Itchi.io now, and is ‘coming soon’ to Kickstarter.